What’s the influence of freezing weather on your water treatment system? What can you do to keep the tap water running and what if the pipes get frozen? 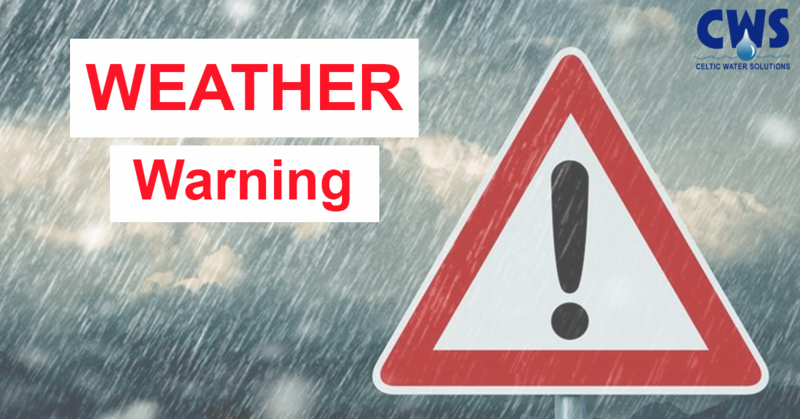 With a severe weather warning in place for the whole of the county we are advising all our customers to pay some attention to their water treatment system. All water treatment equipment should be well insulated. CWS are not responsible for any damage that maybe caused to your treatment system in freezing / poor weather conditions. What can you do keep the tap water running & lesen the risk of frozen pipes? Protect the house as best as you could – leave the heating running a lot longer, maybe at a lower heat, just to have it tipping away. Having an attic with tanks? Then leave the trap door open a bit to bring some heat up there. Accordint to Irish Water, you should cover any gaps under doors and around windows to ensure cold air is not getting inside. Also, try to heat rooms without heaters by opening doors of heated rooms so that the warm air circulates, which will help to prevent pipes and tanks from freezing. Did you know? There are grants available to help you finance water treatment systems. Don’t miss out that opportunity to get a grant to cover up to 85% of the costs! Apply today! A grant of €6,475 / 85% is available to cover the costs for each house in the scheme! Also, there is an annual subsidity offered by local authorities to cover the running costs. In some areas there is no public water supply and a local authority doesn’t plan to arrange a public water system in a near future. In this case, households are connected to a “group water schemes”. A trustee acts on behalf of the households and deals with the local authority. Two or more householders are going to provide homes and farms with a new (previously non-existing) water system. Where households using group water scheme provide their own water treatment plant under a Design, Build, Operate (DBO) contract, a new subsidy is paid to cover the full production cost of treated water for domestic use. How and where can you apply for a group water supply grant? You can apply for a grant if you are using / will be connected to a private well as a household water supply. A grant of up to €2,031.58 / 75% of the amount spent can be received! If your house is more than 7 years old and not connected to either a public or a group scheme, you may be qualified to get a grant. Contact CWS / Call 1890 252 388 or 087 631 3339 for more information now!